1. To confirm that the Darien Gap route is closed to vehicles and to recce the Carti-El Llano road as a means of accessing the Caribbean coast. 2. 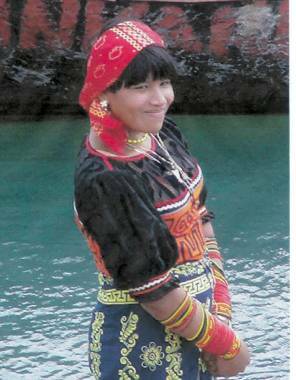 To ascertain the feasibility of sailing through the Archipelago de San Blas using the local knowledge of the Kuna Indians to guide us through the reefs and islands. In 1960 the Panama highway terminated at Chepo 52km east of Panama City. By 1990 the road extended as far as Yaviz – asphalted to just beyond Lago Bayano. Now in 2003 we found quite a number of vehicles in use as far as El Real, having been ferried across the Chico and Tuira rivers. Although a fairly well constructed trail now extends as far as Piji Baisel officially the use of motor vehicles within the Darien and Los Katios National Parks is prohibited. So as we expected (security apart) the overland Darien route is closed to our Land Rovers. We continued on foot as far as Pirre Mountain ridge using Pirre Station as a base. Although advised against it, the park rangers would have been happy to guide us as far as Cana Valley some 12 miles from the Colombia border. Security is taken seriously – road blocks and I.D. checks on the highway from Agua Fria eastwards and in rural areas well protected bunkers on the trails manned by heavily armed police (Panama has no army) logging our movement. No restrictions were placed on us; where we went appeared to be at our discretion. Apart from the riverside villages of the Embara and Wounaan Indians the rangers stations offer the only facilities within the Darien National Park. The San Blas Archipelago is a string of over 340 islands on the Panama Caribbean coast. The islands are usually approached by boat from either Colon, Portobello or by air. Apart from ill defined trails connecting Embera villages with the coast, Rio Chucunaque and ultimately the Pan American Highway there is only one road over the mountains. 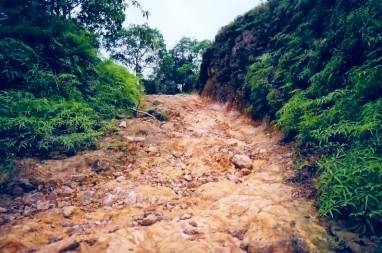 The 50km road was cut through in 1985 to service a non existent tourist industry and its non existent hotels. To prevent settlers poaching Kuna land along the roadside the Kuna established a forest reserve and the Nusagandi Nature Lodge. As the Kuna don’t have any vehicles and the hotels haven’t been built the road has remained virtually unused. I hope to use the road as access to the coast for the Land Rovers. I visited the Land Rover Club of Panama website and learnt of an “Expedition to the San Blas” which got halfway along terminating at the Nusagandi Lodge. I needed to find out just how bad a condition the road was in. The only way for us to do that was to walk it. 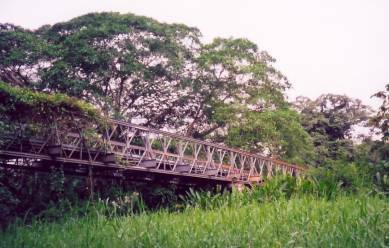 The road begins as a narrow track heading north just outside the village of El Llano 70km east of Panama City. An old car door hangs from a tree branch, in true Wild West style, with the word Carti and an arrow scrawled across it. The first 20km is outside the Kuna Autonomous region so the ranchers have moved in, cleared the forests, fenced the land and settled. Apart from some steep gradients the road is quite passable as it clearly has some use. There is evidence that the road had had a good surface when built. Strangely at about km22 there is a self contained, solar powered, microwave operated ITT telephone box ! The road then quite suddenly deteriorates; the surface washed away down to burnt red earth. Ascending then descending into deep ravines where virtually no bridges were built, only culverts for streams to pass through. We reached Nusagandi Lodge at about km25. The following 20km was made up of narrow ridge top tracks through dense forest and ravines. All traces of the surface grade were now lost; the surface now being made up of hard packed red earth. Any weaknesses gouged out by the torrential rains which fall on these mountainsides In places the ruts were washed out more than a metre deep. Where the road builders had encountered rock passage had only been roughly hewn out leaving sump cracking differential smashing outcrop. The descent to the narrow coastal plain is steep (gradients estimated to be 45º) and punctuated by river crossings where the culverts are completely washed away. One sizeable bridge was constructed over the Rio Carti Grande but unfortunately the North pier appears to have sunk considerably, the decking pivoting on the central pier is now elevated some 4 feet above road level ! The river is fordable and the jungle is actively reclaiming the bridge. The last 2 km is through cultivated land mostly rice and vegetables. The road leads directly onto a short concrete airstrip which in turn leads to the coral shore, a small police hut and the jetty. Moored up are canoes to Carti and the islands of the Gulf of San Blas. All food and provisions were carried on this trek – water is obviously plentiful. Four different species of snake were encountered – all treated with respect, not being Central American snake experts. Having successfully recce’d the roadway we only later heard of some 100m high waterfalls 8 hours hike off the road. We regretted not having the time to visit these. The canoe is the principal form of transport usually paddled for fishing but also equipped with outboards for ferrying goods and people. The outboards power varies from 9 to 90 hp. Hiring canoes seems fairly easy; you agree verbally the destination (not as easy as it sounds as most islands have a Kuna, a Spanish and an English name), how long it will take, how much petrol will be required and the price of the petrol ($3.00/US gallon) with a port official. Whilst a boatman is being found and the boat prepared you will be presented with an invoice with all the details on, to pay. Honesty prevails – we were never overcharged or had to pay for more petrol than was used. We travelled in this way, island to island, from Carti Ustupo (78º 56’W 9º 25’N) to Mulatupo Sasardi (77º 45’W 9º 55’N). Columbian merchant ships ply the coast from Turbo to Colon and back bringing most domestic items and hardware you see for sale in the shops and purchasing the San Blas principal export commodity – coconuts. The region is well served by three airlines: Avirtur, Ansa and Aerotaxi (Aeroperlas). All have offices at Alanbrook Airport in Panama City and with agents in the larger communities. The runways are often short and squeezed onto the narrow coastal plain between the mountains and the sea and make for some very interesting landings. Twin Otters seem to be the most commonly used plane, probably for this reason. A regular timetable is maintained although flights always seem to be over subscribed. 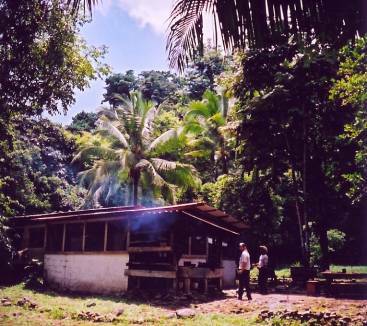 Accommodation is sparse along the San Blas; most of the larger communities have either a small hotel or dormitory for visitors. They are not really geared for foreign tourists but for officials, salesmen and merchants from the mainland. Nevertheless they were always made available for us and were basic but adequate. There are a number of “Eco Lodges” on private islands which are there purely for the foreign guest. Statistically the weather is consistently hot and wet – between 25 and 30ºC all year round with up to 3500mm of rainfall evenly distributed throughout the year (with perhaps a slight letup in February and March and again in September / October). Summer in the San Blas (December to April) is characterised by poor visibility and heavy seas outside the protective reef. Winter (June to November) on the other hand brings light variable winds and calm flat seas but small (often less than 2km) squalls with local winds of up to 45 knots can occur at any time. The San Blas is well south of the hurricane track. Tidal range is only 30cm. Offshore current prevailing easterly, with no discernable current inside reef. Between san Ignacio and Achutupo there is a large gap in the reef; we encountered a swell of 3-4m which was quite alarming in a dugout canoe but our boatman remained unperturbed. The San Blas is well charted in the west but less so in the east. With so much sunken reef and barely visible coral heads local guides will be essential to negotiate a safe passage. The Kuna, although tolerant of travellers passing through their land and do not hinder or impede them in any way, give the impression that they don’t mind if you pass them by altogether. The actions and behaviour of visitors is viewed critically with any misdemeanour or offensive behaviour reported to the Sahila. The safe passage of the expedition to reach the road head at Turbo in Colombia will rely on the help of local boatmen. It is therefore necessary that the expedition enlist the help guides (possibly Ancon Expeditions, Panama or similar) to ensure we maintain the highest standards whilst in the Kuna Yala. The Kuna, while indifferent to visitors, would I hope see the expedition as a business opportunity and assist it on its way. 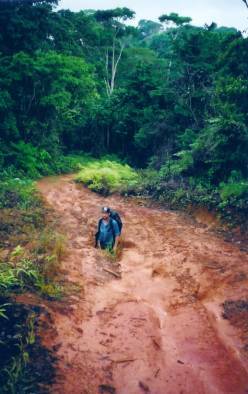 The passage of vehicles through the Darien Gap is an adventure of the past. “Driving” down the Archipelago De Sans Blas will be the adventure of the future. Using the Carti to EL Llano road, although a challenging winch and machete operation will pale into insignificance beside Siberia and Alaska. That having been said it would be a fine Camel Trophy’esqe opportunity for “guest volunteers” to experience an expedition of this type. With rigid compliance to Kuna sensitivity and securing their assistance I think sailing at least as far as Zapzurro is within the capability of the vehicle we have at the moment. Up-to-date security information south of Puerto Obaldia must be sought and also more information on conditions crossing Golfo De Urabia to Turbo.